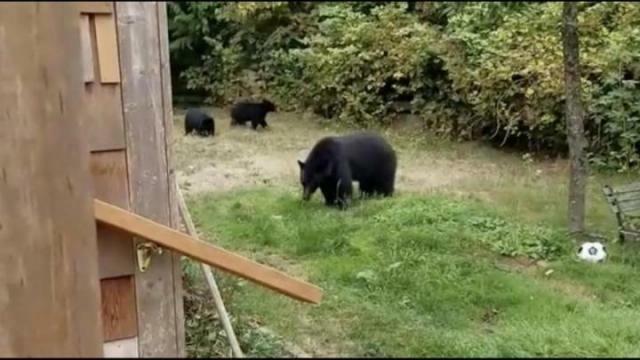 Sep. 23, 2017 12:30 p.m.
A Vancouver Island man’s encounter with bears in his backyard is getting plenty of attention online for being so politely Canadian. In the clip posted on social media Friday, Sooke resident Jordan Cote can be heard asking the four-legged family to leave, because he has to get to work. Possibly a coincidence, the equally-polite mother bear turns and walks with her cubs into the bushes on the left corner of his property. The video was posted to a local Facebook group, and has since been shared more than 2,400 times. Most of the comments praise Cote for his “Canadian hospitality,” and for remaining calm. When one does encounter a bear in a residential area, the Ministry of Environment urges to remain calm and keep away from the bear.